Liz Earle Haircare // As Good as I Guessed! I solemnly swear that this review is not biased due to my new found love obsession with Liz Earle. I promise you -I’d be writing this even if I hadn’t fallen madly in love with the skincare routine (catch my review of Cleanse & Polish here). It’s been long awaited (due to one of the ingredients from the old formulation going extinct or some equally exotic excuse) but the newly relaunched haircare range from Liz Earle is finally here – and I’ve been using it for the past three weeks, and can confirm that its bloody marvellous. The range, hmm, can you call it a range? Well, the shampoo and whichever conditioner you go for (there’s three to choose from) are all as lovely as you’d expect from Liz Earle – after years in development the botanists and beauty experts finally discovered the Kalahari Melon’s oil which is gentle yet so effective at hydrating and smoothing hair down. Just like the Cleanse & Polish, there is just one shampoo – the Botanical Shine Shampoo – and no, it’s nothing like those ‘one size fits all’ watered down versions, instead it’s a foam frenzy of melony loveliness – and you only need the tiniest amount. If you’re willing to share the Liz Earle shampoo then it’s ideal for use by everyone in the family. The formula works with all hair types and the smell definitely isn’t too feminine (I know my boyfriend has been pinching it!). The conditioner is where you choose the right one for your hair type, I use the one for normal hair which left my hair gorgeously soft and shiny – next i’ll try out the one for dry/damaged hair which contains shea butter and is supposed to be fabulously rich and luxurious. Theres also one for oily hair and it’s a much lighter formulation. To finish it all off, a fabulous Botanical Shine Nourishing Hair oil which I slick through the ends of my damp hair before brushing – it smooths split ends, speeds up drying time and protects from heat damage – basically everything you’d want from a hair oil, and oh how I do love a multi taker! Overall I give the Liz Earle haircare range a big nod of approval, which honestly I’m not surprised about. If you hadn’t already guessed I’m pretty much a Liz Earle convert – she can do no wrong in my eyes! The shampoo and conditioner are available in a 200ml tube and are £10 each, apparently you can get about 30 washes from each tube if you don’t go crazy with the amount, so its good value for money for such wonderful products. The oil is £17.50 and seems as thoughts its going to last a long long time. The Liz Earle haircare range is out now, available online here and in stores such as larger Boots stores. 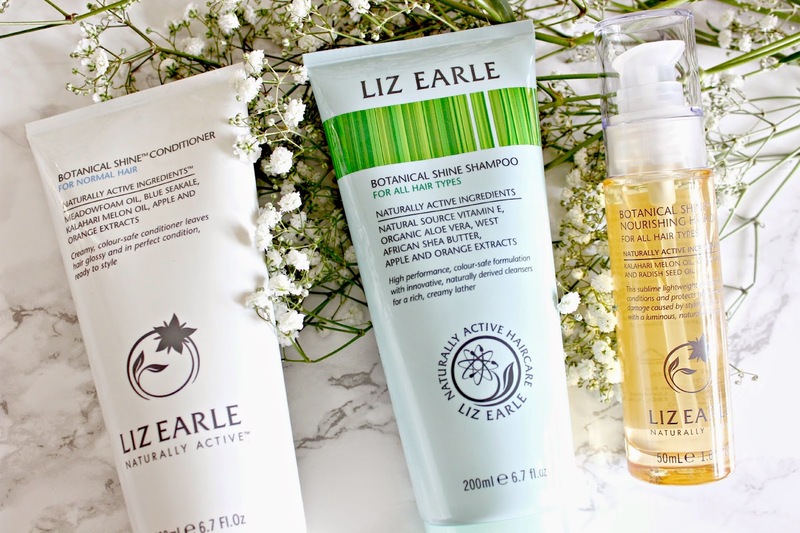 Have you tried Liz Earle haircare yet? Previous Post Inside my Bathroom!